The XLT-3255-TS uses vertical streams of hot air from 4 pairs of tapered ducts blowing on a stainless conveyor belt. These ducts are configurable and adjustable. This cooks your product evenly and quickly. The cook times are adjusted digitally by the conveyor and temperature controls. • The XLT-3255-TS is available in three configurations, the single, the double, and the triple stack models. 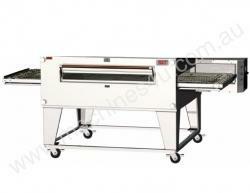 • The optional front sandwich door is provided to load or unload product for different cook times. • Both exterior AND INTERIOR exposed surfaces are made of easy cleaning stainless steel. • XLT™ ovens are manufactured with pride in the USA under stringent quality standards. • Replacement parts are readily available nationwide (Grainger®) and through our Fast Parts Program direct from the factory, at a fraction of the cost of our competitors. • The large removable front panel allows for easy access to oven interior, making cleaning much easier than our competitors’ ovens of the same size. • All XLT™ ovens are 100% factory tested with a minimum 4-hour burn-in time.